Why are Certain Companies in the Top Companies in Paid Ads Chart Greyed out? Kompyte detects companies which you are not currently tracking but who are running ads for many of your keywords. 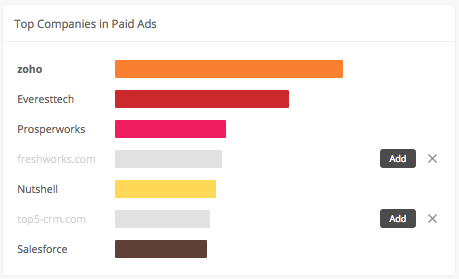 These companies appear greyed out in the Paid Ads chart along with your tracked companies. You can begin tracking these companies by tapping the Add button to the right, or if you prefer to eliminate the company suggestion, tap the X button.